This is a great change on your standard chocolate pie. 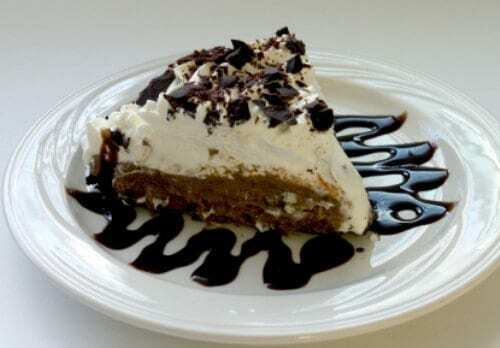 French silk pie is so easy to make, enjoy this chocolate dessert anytime. Combine the egg whites, salt and cream of tartar and beat to a stiff foam. Beat in the vanilla. Add the sugar gradually, beating until peaks are formed and the sugar is dissolved. Spread in a well-greased 9-inch pie tin. Build up the sides; sprinkle the bottom with chopped nuts. Bake in a 275-degree oven for 1 hour. Cool and fill. Beat softened butter in the electric mixer until fluffy. Add the sugar gradually and beat until smooth. Melt the chocolate over hot water and add with vanilla to the creamed mixture. Beat in. Add the eggs, one at a time, beating 4 minutes each time. Pour this mixture into Meringue Pie Shell and top with whipped cream flavored with creme de cacao. This pie was really good! I used Chocolate flavoring instead of the creme de cacao. Next time I’ll try it with the cream de cacao.